Generation C (Gen1) standard 3 count round liner is commonly used for line work and fine shading. Original Generation C (Gen1) T-Tech needle cartridges have a patented design. Each 3-point liner has a standard twist lock mechanism, compatible with all conventional tattoo machine grips. It securely locks the cartridge in place for safe tattooing. The round liner configurations are available with 1, 3, 5. 7, 8, 9. 11 and 14 needle points. 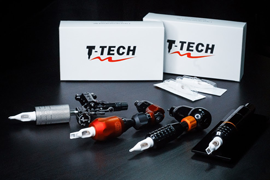 T-Tech round liners are configured in a perfectly round shape and are manufactured with long tapers to create tightness between the needle points. These liners are #12 (0.35mm) in diameter and have long tapers (4mm). They are great for lining, dot work, detailed work as well as larger needle counts can be found used for shading small areas. Each box contains 20 individually packaged needle cartridges of your chosen round liner configuration. All cartridges are EO sterilized and individually packaged.